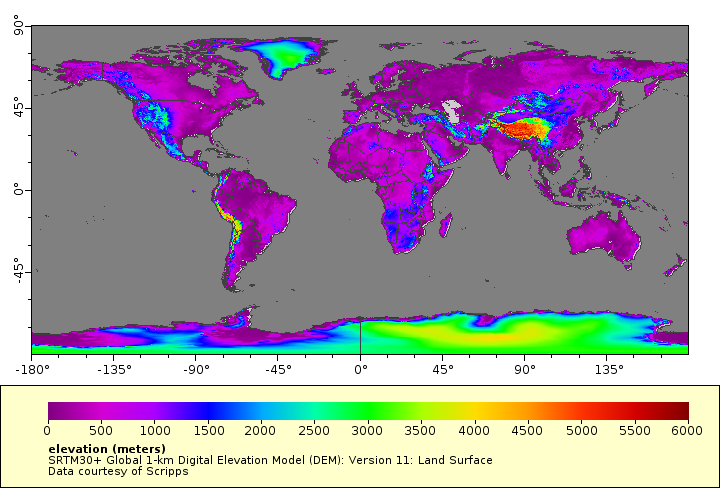 A global 1-km resolution land surface digital elevation model (DEM) derived from United States Geological Survey (USGS) 30 arc-second SRTM30 gridded DEM data created from the NASA Shuttle Radar Topography Mission (SRTM). GTOPO30 data are used for high latitudes where SRTM data are not available. This URL provides a viewer for this dataset. Purpose PacIOOS provides timely, reliable, and accurate ocean information to support a safe, clean, productive ocean and resilient coastal zone in the U.S. Pacific Islands region. Lineage Statement PacIOOS obtained data files from Scripps ftp then masked out the ocean data and converted to NetCDF format (05/2015).